Daily milk yield of goats and cows follows a predictable pattern. 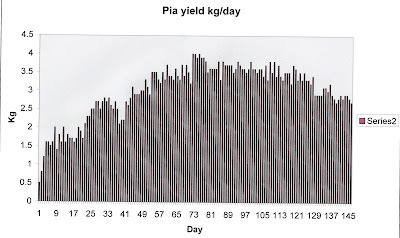 Yield reaches a peak usually ten weeks after kidding but can be as early as two weeks in very high yielding older goats. After peak production yield declines linearly at about ten per cent a month. 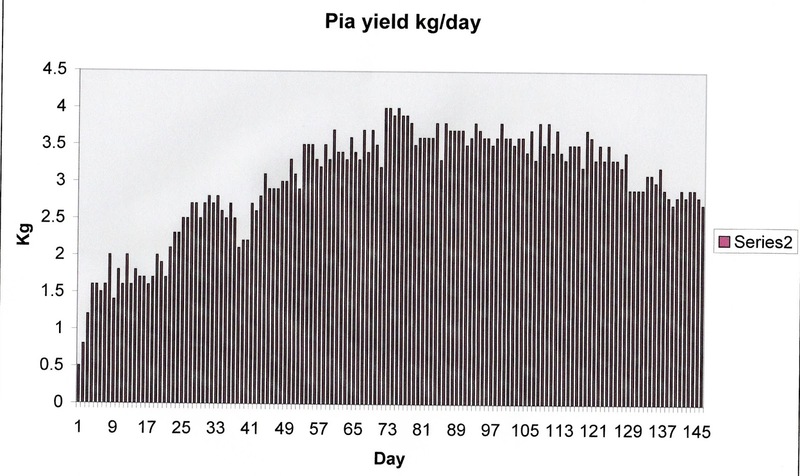 You can see from the graph that Pia is average, she peaked at ten weeks while giving four litres a day. Of course the graph isn't a smooth curve because we are dealing with biology there are daily variations in food quality, food intake, weather and of course the milker. Pia seems to give more when Dale is milking.... more empathy perhaps or softer hands or both? If she milks for ten months (300 days) before drying off and kidding again in month twelve; she should have a total lactation yield of about 750kg..... not bad for an animal weighing 60kg. Dairy goats do differ from cows in that they are less affected by changes in the milking routine or between hand and machine milking. Most important they will sometimes continue milking for extended periods; up to three years after first kidding.